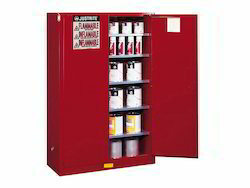 Safety cabinets offer safe, dependable flammable liquid storage and protection Protect workers, reduce fire risks, and improve productivity by storing flammable fuels and chemicals in code-compliant safety cabinets. Designed to meet OSHA and NFPA 30 standards. Sure-Grip® EX cabinets are constructed of sturdy 18-gauge (1-mm) thick double-wall, welded steel with 1-1/2-in (38-mm) of insulating air space for fire resistance. High-performance, self-latching doors close easily and securely for maximum protection under fire conditions. Fail-safe closing mechanism ensures three-point stainless steel bullet latching system works every time. For added security, U-Loc™ handle comes with a cylinder lock and key set or accepts an optional padlock.Haz-Alert™ reflective warning labels are highly visible under fire conditions or during power outages when illuminated with a flashlight. Patented SpillSlope® galvanized steel shelves direct spills to back and bottom of a leakproof sump. They adjust on 3-in (76-mm) centers for versatile storage. Cabinets also feature a leakproof 2-in (51-mm) bottom sump, dual vents with flame arresters, four adjustable self-leveling feet, grounding connector and trilingual warning label. Durable lead-free epoxy/polyester powder-coat finish provides excellent chemical resistance. All cabinets are FM-approved and come with a warranty. Dispensing cans permit easy, one-hand dispensing of liquids directly onto work surface. 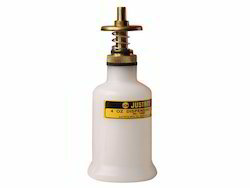 brass dispenser valve minimizes spills and controls excess. FM Approved brass valves are ideal for use with flammables. Textured, high-density polyethylene body provides a firm grip. Dimensions, Exterior: 2.25" Outer Dia. 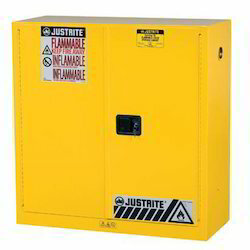 JUSTRITE Safety Cabinet - 30 Gallon (114L) - 8930001 - Made of 18 gauge (1mm) Double Wall Steel with 38mm of Insulating Air Space. Fully Welded Constructions with continuous Piano Hinjus fitted with dual Vents with Built-in Flame Arrester. Cabinet is provide with 2"" Height Liquid tight Containment Sump to hold any leakages- Adjustable Shelves Provisions- Manual Close Doors (when pushed closed- doors will automatically self latch) with Flush Paddle Handle with Slip Resistant Grip with provision for double key set (one keyed lock). 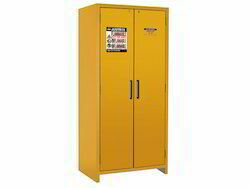 Fully powder coated- Durable & Chemical Resistant Cabinet with High Reflective Band. Dimension: H44"" x W43"" x D18""- Colour: Yellow- Cabinet: Manual Closing Double Door with 1 Shelves. Approvals: FM- N- O." Vapor trap cartridges for safety cabinets. 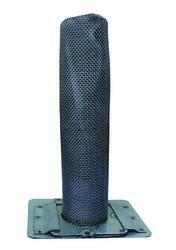 Activated carbon cartridges absorbs the volatile chemicals and organize vapor. Cartridges is supplied with steel cage which is connected with magnets, so that it can be attached to any metal surfaces. Carbons cartridges can be easily replaced with the new cartridges. Dimensions, Exterior: 8.75" L x 2.25" Outer Dia. 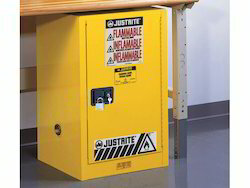 Looking for Justrite Safety Cabinets ?